FEMA rules require a community to disallow any new residential construction with living space below the BASE FLOOD ELEVATION (BFE) in order to qualify. 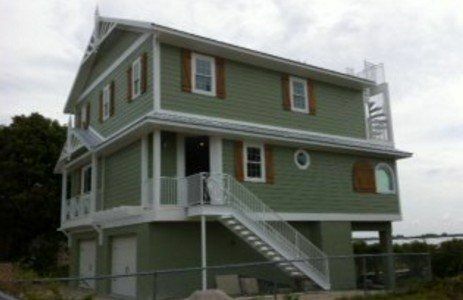 Practically for Florida, and most coastal communities like Anna Maria Island, this means building elevated homes. The first floor needs to remain unoccupied space (below BFE) and may not be used for living. No electricity, just a big waste of space. FEMA has the megalomania to regulate whole communities instead of individual projects. Flood insurance is an individual choice or individual requirement. But FEMA requires the whole community to obey their rules to qualify. Anna Maria Island is changing. Small cottages (ground level) cannot be built any longer new. Since the 1970s. Even renovations are limited to 50% of the building value of renovation, otherwise, it’s illegal. This rule has been existing for quite some time, but now local government with their megalomania are starting to enforce. Local Lawsuits follow, costing taxpayers money. Our famous FEDs even enacted legislation to regulate that. So the reality is, small cottages are too small to give a great ROI with skyrocketing insurance rates. Building new costs more, because it needs to be built elevated. So anybody not needing Flood Insurance, because he / she pays cash or finds a portfolio or private loan without the Flood insurance requirement, is bound by FEMA. Even if the land value is higher than your loan, the FED regulated banks will require flood insurance for that tiny cottage. Even a Billionaire building a mansion is out of luck as well as the retiree looking for a nice (new) little cottage. Not available anymore. The consequence: Investors buy cottages, one-by-one, tear them down and built the maximum available living space on 3 or 4 stories, with up to 10 bedrooms to use as rental space on a tiny lot. Instead of lovely cottages, box houses are built changing the coastal areas forever. Now the local residents get upset and the commissioners. Well, you or your predecessor enacted the legislation to comply with FEMA. Question that my friends! The good thing for Anna Maria, no high rises here, but elsewhere, this will become a nightmare over time. But one questions remains: Why do all these old houses still stand when they are so dangerous (per FEMA discretion)? By the way, FEMA was enacted by congress. But all these rules covering building requirements for whole communities and owners who are not even interested in buying subsidized flood insurance, are not. So in 2025 the same property will be at $6k annual flood insurance with a value of $100k. If you consider buying a Pre-Firm property, it is important to educate yourself regarding realistic flood insurance in future. Don’t rely on current rates as those will significantly increase over time. Better get a EC to estimate future target rates to get a realistic picture. If you have the financial means covering a loss and you don’t need a mortgage, consider the land value vs. the improvement (i.e. dwelling value). On the other hand side, who wants to take 10 steps or more to go to the pool or use a BBQ 10 times a day? As long as the risk is realistically calculated an older home may be highly attractive and very sought after in future. Our goal is not to just sell, real estate has its balls and whistles and we are going beyond the scope of many colleagues to make you be happy with your purchase. That’s Sea to Sky Realty’s approach. BTW: It is highly unlikely, if not impossible, that government controlled flood insurance rates will decrease.